The Atlantic hurricane season's first named storm headed north Thursday toward the Gulf Coast as Florida residents, still recovering from last year's devastation, watched with a wary eye. Tropical Storm Arlene had maximum sustained winds of 40 mph after strengthening from a tropical depression that formed Wednesday, the National Hurricane Center in Miami said. Tropical storms have top sustained winds of 39 mph to 73 mph. 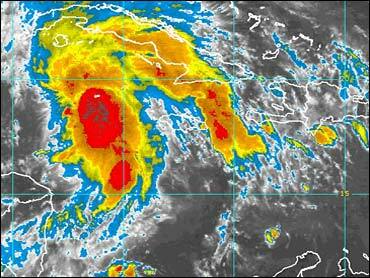 At 2 a.m. EDT, the storm's center was about 65 miles south-southeast of the western tip of Cuba. It was moving north near 8 mph, and could cross near or over western Cuba Friday morning, forecasters said. The large storm's winds and rain extended 115 miles to the north and east from its poorly organized center. Arlene was expected pick up forward speed and turn to the north-northwest and enter the Gulf of Mexico Friday, forecasters said. "This storm will probably be a U.S.-landfall storm, as maybe just a tropical storm, and it will be later in the weekend," said CBS News Meteorologist George Cullen. "Right now, it could be anywhere from the western shores of Florida to the lower areas of the Mississippi, around New Orleans." A storm this early says little about the rest of the season. "It happens once every two or three years that you'll get a storm in June, but it really doesn't mean that the storm season is going to be tremendous," said Cullen. Forecasters earlier warned that heavy rain in Nicaragua and Honduras could cause flash floods and mud slides. It was expected to enter the Gulf of Mexico by Friday — a path that prompted authorities to warn residents of coastal communities to beware. "Our best estimate of the track possibilities are that anywhere from Louisiana to the Florida Panhandle could expect the center to be approaching them by the middle of the weekend," said National Hurricane Center specialist Richard Knabb. In Cuba, heavy rains began falling on Havana and the rest of the western part of the island Thursday. A tropical storm warning was declared for Havana city, the surrounding Havana province and the western province of Pinar del Rio, as well as the small Isle of Youth off the southwestern coast of the main island. Residents were advised to remain tuned to state media to be informed about possible evacuations and other civil defense news. In Florida's Panhandle region, residents were told to prepare for possible heavy rain and flooding this weekend. Hurricane season began June 1 and ends Nov. 30. Last season, Florida was struck by hurricanes Charley, Frances, Ivan and Jeanne; between them, the four storms damaged one out of every five homes in the state. The storms caused about 130 deaths in the United States and are blamed for $22 billion in insured damage. Forecasters said Arlene was likely to remain a tropical storm, but Navy meteorologist Lt. Dave Roberts said there was an "outside shot" the system could develop into a weak hurricane. The storm was already causing heavy rain and squalls across the Cayman Islands. Forecasters warned that very heavy rains in Nicaragua and Honduras could cause flash floods and mud slides.